The SOS Dan Buoy is patented, man overboard equipment, ready for instant deployment. The ultra fast and reliable self-righting properties ensure that just when time matters most, the SOS Dan Buoy is always ready. It increases vital visibility and buoyancy for the person overboard. 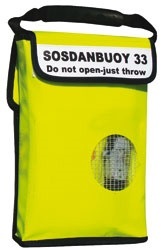 The SOS Dan Buoy system is compact, easy to use and very visible. It folds away in a easily stowed carry bag. SOS Dan Buoy is a compact, self contained device, specially designed to make rescue and recovery a simpler operation. 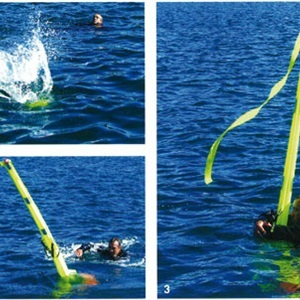 There is no need to set or activate the SOS Dan Buoy just throw it into the water, towards the person overboard.